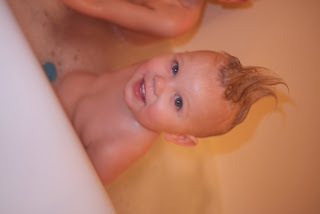 Generally I keep it positive on the blog, you know cute things the kids did and so on. However today I feel the need to vent. On Saturday some of my wonderful friends helped me clean my brand new house. Now my brand new house is nice and clean and ready to move in BUT Home Depot will not install our carpets. They were supposed to be installed on Wed. and now almost a week later we are still waiting. I can't believe how much they have dropped the ball on this, come on haven't we waited long enough? Living in the condo has been great and I haven't minded it at all, but seeing my beautiful new house ready for us to live in made it really hard to come back to our in-between world in the condo. I am ready to get settled in, maybe Home Depot will come through for me tomorrow . . . I'm behind in my blog but I have to do this one while it's fresh. The last time I cut Vaughn's hair he cried through the whole thing so I missed a lot of spots. I thought it would be a good idea to cut his hair before we move just so it's done. I got him sitting and ready to go with his towel over his mouth and face. I was about to start when I remembered I hadn't checked what blade was on. I figured I was the last one that used it so it must be the right one. I turned the clippers over and saw the #3 so I knew I was good to go. I know that you are supposed to start from the back when you cut hair but Vaughn is usually crying by the end of his hair cut so I start at the front so that it doesn't get in his mouth while he's crying. Away I went with the clippers right down the middle. I screamed and ran into the kitchen after the first swipe. I was wrong about which blade I had put on and Vaughn had a buzzed stripe down the middle of his head. When Matt and I looked at the clippers, sure enough it did say 3 but it said 3mm #1 . . . doh!!! What I didn't know is that Matt has been using the clippers to trim his goatee so he left the #1 blade on and because I figured the blade was right I went ahead when I saw a 3 instead of making sure it was the #3 not 3mm. In typical Jamieson style when things go wrong we make the best of it. We all had a really good time cutting Vaughn's hair in funny way's until it was all done. I was laughing so hard I was crying at one point. Which led Greta to say, "Mommy cry? Are you ok Mommy?" I feel terrible that I did this to Vaughn, especially since the weather is going to be -30 this week and he could have used the extra warmth. But I know it will grow back and I'm pretty sure I'll never do this again. And of course he is handsome no matter what his hair looks like! Vaughn has to get glasses. I have mixed feelings about this latest development. On the one hand I am very glad that he is going to get his eyes fixed, so hopefully he'll stop squinting his eye and complaining it hurts. On the other hand I don't want anything covering up his perfect little face. We noticed over Christmas that he seemed to be squinting his left eye a lot. When I asked him if his eye hurt he said yes. Matt and I conducted a very scientific and accurate eye test at home to see if we could notice anything. We pulled up a kids eye chart on the computer and then covered each eye to see if he could see properly. Even our crude test was pretty obvious that there was a problem. Wednesday we headed to the eye doctor. Thankfully I have the best boy who thinks going to the eye doctor is a super fun adventure. I told him a few days a head of time that we were going and what to expect. He was actually really excited and kept asking if it was the eye doctor day yet. When the time finally arrived he was amazing. The technician and doctor both commented on how great he was. The technician even said this was the first time he'd even been able to do the complete testing with a 3-4 year old. The end result is that Vaughn has a 'lazy eye'. It most likely started with him not seeing properly out of his left eye so over time he stopped using it. Next Friday we go back to the eye doctor so they can dilate his eyes to get a better look to make sure there isn't any more damage. Then I imagine we will get the prescription for his glasses. He will wear them for 3-4 months to see if he will start using his left eye again once he can see out of it properly. If that doesn't work he will have to have a patch. It sounds like the end result will be pretty positive. His sight out of his left eye will never be perfect but if he starts using his left eye properly he may not need glasses again for a few years. Vaughn is very excited about getting glasses and has told us he wants a black pair like Daddy. We'll see what we end up with but I'm sure he will look super handsome with his glasses. And we've already been practicing how we are going to laugh after the doctor puts the eye drops in . . . see I really do have the most amazing boy! Last Sunday was a bittersweet day for the Jamieson's, the team we were cheering for won the Superbowl but it wasn't our Patriot's in the game so it wasn't as sweet as it could have been. This year we had a family superbowl party. Some of you may be surprised to discover that I actually enjoy watching football. I like it best when watching the Patriots but I can also get into the Superbowl, because it's fun and involves yummy food. I was really excited, we all put our Patriot's jersey's on, ordered pizza, ate chips and just had a good time. The kids only lasted a few minutes and then I spent the rest of the time trying to keep them quiet so Daddy could watch the game but all in all it was a fun family Superbowl party! Vaughn started singing a Teddy song today. I'm not sure if he heard it somewhere or if he made it up but it goes a little something like this . . .